Ausflag today launched a design for a new Australian Flag: "The Australian ′Commonwealth′ Flag." 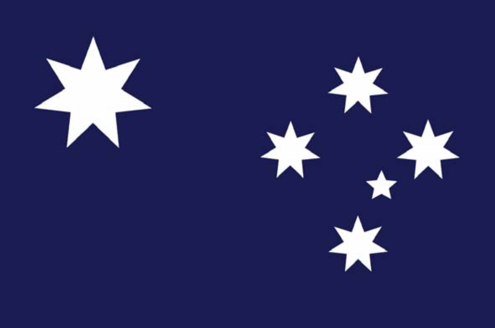 The Executive Director of Ausflag, Mr Harold Scruby said: "This new minimalist/evolutionary design is based on the "Commonwealth Star" (commonly known as the Federation Star) replacing the Union Jack. It could not be more simple. It′s a natural progression. "The current design symbolises Great Britain dominating Australia. It depicts Australia as a British colony: A veritable British branch office. This new design puts the Australian Commonwealth in the primary position. It celebrates "egalitarianism" over "aristocracy". It celebrates "independence" over "dominance". It celebrates Australians united by a common interest. a federation of states and territories with powers and responsibilities divided between a central government and a number of smaller governments, each controlling certain responsibilities in a defined area. any body of persons united by some common interest. "It′s vital we tell the world we′ve grown up. "This campaign is not anti-British. It’s passionately pro-Australian. It’s no more anti-British than when we changed our national anthem from God Save the Queen to Advance Australia Fair. "And as to branding; placing the symbol of a major sporting and commercial competitor in the dominant position on our flag is as ludicrous as Microsoft placing an Apple logo in a dominant position on their logo and promotional material." Mr Scruby said. Read Dr Lowitja O′Donoghue′s Article about how indigenous people feel about our flag.